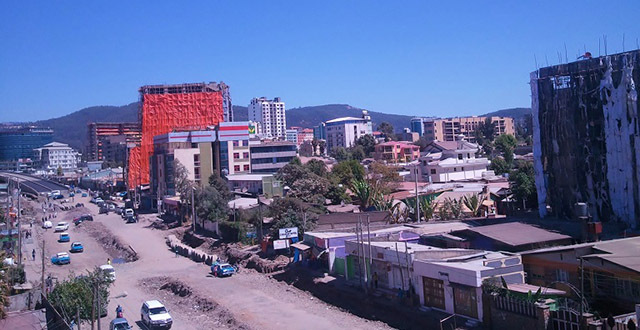 Haya Hulet is one of the areas of Addis that is getting a complete construction overhaul. With the new LRT being built that will pass straight through the neighbourhood and repairs underway to improve the old roads, Haya Hulet can be an extremely overwhelming area to go for a walk. Located between Urael and Megenagna, Haya Hulet can a very busy place with all its shops and stores. With the rent of a four bedroom nice old house with hardwood floors being anywhere from $1,250 USD and up, living in Haya Hulet is not as cheap as it used to be. The rent of an unfurnished one bedroom space in a shared compound would go for a minimum of $450 per month. In November 2014, I was looking for a house and was surprised to find out that I couldn’t find a two bedroom place for less than $600 unless the house was unfurnished or the compound was shared with the landlord. Regarding shared housing, I know of someone who lives with three housemates in an old big house and the rent per month is $300 per person. Prices have surely gone up a lot within the past few years for Haya Hulet’s residents and will definitely go up even more once the railway and the roads are finished. If you are looking to buy some clothes, you are in heaven. Everything from fake Louis Vuitton Chinese copies to nice and affordable European and American brands are all there. Especially the street that stretches from Haya Hulet out to Bole Medhanealem is full of these stores. There are also two supermarkets just a couple of hundred meters away from each other by Zerihun Building. You can find most of the stuff you need between these two supermarkets. For other small things there are always plenty of those small shops that you can find everywhere in Addis. There is also a big duty free store but it is only for those who have the duty free status, people who work for embassies and NGOs. There isn’t much to do when it comes to recreational activities in Haya Hulet but it is close to Bole and Megenagna so you can always go to these neighborhoods to find something you cannot find in Haya Hulet. There are of course gyms that are open for membership all year round in most of the hotels including Capital Hotel and Axum Hotel. Capital Hotel also has a swimming pool and there is soon going to be a full spa as well. There are a lot of those copy cafes with nothing to differentiate then from the rest. The ubiquitous all coffee, tea, cake and soda menu. But that is what Haya Hulet is all about. A lot of same things, everywhere. If you want just a coffee all you have to do is basically walk in to the next café you see. Yeshi Buna – Located just at the end of Chechnya road, Yeshi Buna is known for its 24 hour service and delicious Ethiopian food. It is common to see this place packed at 4 and 5 in the morning since people like to make a stop there for a quick bite after a heavy night of partying. Zebra Grill – One of the well-known and old restaurants of Haya Hulet, Zebra grill is known for its selection of European dishes (Chicken being their specialty) since the rest of the restaurants mostly just serve Ethiopian. Pizza Corner – Just across the street from Yeshi Buna, Pizza corner is one of the newest additions to the restaurants of Haya Hulet. They have a selection of nice dishes and combos of your choice. Right next door, there’s an ice cream place that serves different flavors of ice cream and shakes. But what they are most known for is obviously their pizza. I’d recommend it. Elsa Restaurant – All you’ll find here to eat is Ethiopian. ‘Qurt’ and ‘Kitfo’ which are both raw meat dishes, is what you will most likely to see people ordering since they are known for their good quality meat. They have a variety of Ethiopian dishes on the menu to choose from so it might be better to go there with an Ethiopian the first time. Just like the cafes, there are loads small bars that are all quite similar to each other. Whatever you can find in one bar, you can likely find in the other. Unless you are shopping for prostitutes, just jumping in to one small bar gives you the experience of all. But then there is Tobia, Known for their ‘Tej’ which is honey wine, and their Ethiopian dishes. Even though it cannot be classified under nightlife because it closes down at 10pm, a lot of nights start there since Tej has the tendency to make people go merry. And then there is Road Runner where people like to go and get beers sitting around the fire. It had a nice atmosphere and friendly people both times I went there. Fiesta – A place with two bars on one floor, with the small one as the VIP, Fiesta is like the bars you find in Bole. It has that lounge-y look and a DJ that loves to play either dance or Tigrigna music. Which can be a bit of a weird mix. But all in all it is a fun place to hang with a hookah on your table. Thanks Kirsty your page answered all my questions about the area!